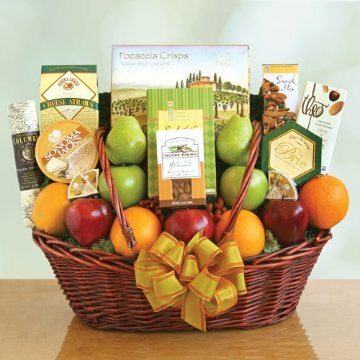 An assortment of fruit , cheese and snacks fill this beautiful basket that is shipped right to their door. This gift basket makes the perfect gift for birthdays, get well or any ocassion at all. This basket includes the follwoing: crispy apples and pears, juicy oranges, cheese, cookies, focaccia crisps, Columbus salami, cheese straws, almonds, pistachios and Ghirardelli chocolate.